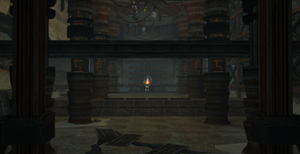 The Research Entrance is a room in the Phendrana Drifts. The room connects the Specimen Storage to the Hydra Lab Entryway and the Map Station. When Samus first enters the room, a Sentry Drone will detect her, and a number of Space Pirates will attack. During the attack, four shield walls will raise in the center of the room just in front of a small set of stairs, providing cover for the pirates. These shields will lower once all of the pirates are defeated. A small door on the right leads to the Map Station, while a walkway leads up to a higher level. The walkway is supported by four pillars, and leads up counterclockwise. This level has an Auto Defense Turret, and a Purple Door to the Hydra Lab Entryway. Shadow Pirates will appear on later visits. The room is filled with mist, decreasing visibility. This page was last edited on 7 March 2018, at 01:53.